I have to say that I totally agree with Kea. In fact I considered writing a post saying very much the same thing. But, quite wrongly, I shelved it rather than face a social media storm triggered by the very politically incorrect suggestion that Wagner, Mahler and Shostakovich sound like film music. (Before tweeting please note that the key line in the comment is that "film music sounds more or less like recycled bits of Wagner, Mahler, Shostakovich, etc".) Kea's comment is particularly relevant as BBC Radio 3 and others are currently touting film music as the new classical, and the observation that great music "actually requires people to listen actively rather than being pulled along by emotional propaganda and rhetoric" says it all in just fifteen words. Music from before Beethoven (and also, incidentally, from after Shostakovich) no longer makes the box office hum because dumbing down has dispensed with active listening, and, instead, tries to win new audiences by media fuelled emotional propaganda and rhetoric. If classical music wants to expand its audience it must revive the lost art of listening. 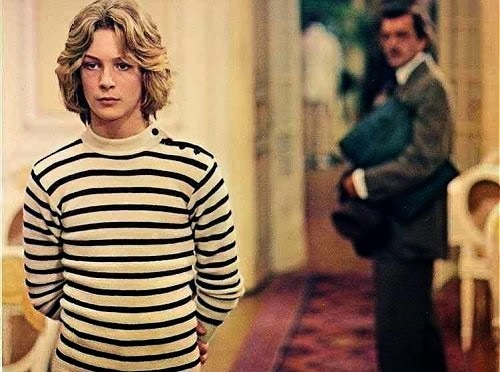 Header image is, of course, from Luchino Visconti's Death in Venice which, famously, used the Adagietto from Mahler's Fifth Symphony in its soundtrack. Any copyrighted material on these pages is included as "fair use", for the purpose of study, review or critical analysis only, and will be removed at the request of copyright owner(s). Also on Facebook and Twitter. My fav (only partially sarcastic) expression about Mahler is that I listen to his symphonies because it is listening to a film score without the emotional baggage of having actually watched the film. I did get into the classical music listening world by way of being a film-music (specifically John Williams and Jerry Goldsmith) fan, plus the touches of Disney's Fantasia and the like. My mathematical-analytical mind did prefer Bach and Beethoven a touch more at first, but the one-two of Bernstein's Harvard Lectures, followed by Rattle's Leaving Home, really turned me towards the modern. Having a context for *why* the music sounded as it did made a huge difference in how I heard the works. This was something my music appreciation prof in college didn't do, having just declared, Cage-like, that the 20th century had no rules - i now disagree with him strenuously: the rules of 20th century composition are that you have to make up your rules (at least, to earn any respect among composers and academics), which is not the same thing as his somewhat shallow interpretation of Cage. Granted, there were only 2 days of class left in the semester by the time we got to that part, and an elective appreciation class covered more of the 20th but I didn't take it. I definitely agree that it is film music that has taken the style of Mahler etc (I would add Copland to that list: his early jazz-era syncopations are very much at the heart of Williams, particularly the battle scenes he scores), but that the original author was right in that film music CAN be a key to at least starting to introduce someone to the classical world...just don't stop with the Romantics. You write that a key is to "revive the lost art of listening", which I agree...but there's I think a deeper problem to solve: we must first revive the lost desire to learn. One actively listens when one truly desires to learn something from what one hears, and western society as a whole has seemed to have lost that desire to learn that we once had in our more Enlightened 18th century ancestors. This has had consequences far beyond Classical music's ticket sales, of course, but that's beyond the scope of a blog comment. To my ear, film music sounds like warmed-over Wagner, Mahler, Strauss, etc. So I'm in fundamental agreement, though I don't listen to film music alone (w/o the film) under almost any circumstance. I haven't followed your links, but the missing piece here is that film music and its hyper-Romantic antecedents communicate emotion more directly that other styles. It's sumptuous and dynamic. Music prior to ca. 1825 has different ways of communicating, which are often interpreted as more intellectual or more Classical (e.g., having more to do with form and balance than emotion). I'm an active listener in all genres, but I would make no bones about it that the Romantic style is far more immediately engaging than any other, though not to the exclusion of others. One might also remember that in early cinema, music was performed live and there was no dialogue, just title cards. Both actors and film score composers quickly developed a highly distilled repertoire of gesture and rhetoric that we still recognize today as substitutes for the emotional content that comes out of story. When I saw the post about the pre-1827 premiere league, I thought someone had hijacked the blog. I think I can agree with Kea's quoted comment in this post (except for the absurd idea that anyone is crying "Not enough Pettersson! "), but not with your very telling replacement of "Bach, Mozart, or Haydn" with "great music" in your own comments. At least neither of you seems to be pinning the blame on Mahler and co., though I'm confused by Kea's identification of Elgar with "film-music-sounding composers". Should I believe that his choral repertoire has been compromised by Hollywood's disciples of Orff? Well, I am flattered that my comment was deemed interesting enough to merit a post of its own, but must emphasize that I never claimed that requiring active listening and comprehension is what makes music "great"—simply that such music is declining in popularity. It would be silly to claim that Wagner, Chaikovsky, Strauss, etc, are "less great" just because they are more accessible. Blair, you'd be surprised—there is a vocal minority that likes to complain about how neglected certain composers are, and Pettersson is one of their chief causes célèbres. Never mind that his complete symphonies have been recorded twice. As for Elgar, Americans seem to know him mostly from the orchestral music. Choirs aren't very big over there. Joe Shelby, getting "into" classical music via film seems to be fairly common nowadays, so I can sort of see the logic behind programming film music at the same concerts/festivals as classical. I have the opposite sort of problem. Certainly I was exposed to both hyper-emotional film music and hyper-kinetic pop music as a child—but, for whatever reason, I rejected both of them. I still don't really enjoy listening to anything that has a continuous sequence of repetitive beats, or anything where the emotions are colour-coded for your convenience. But my inability to experience—I do not say understand but truly experience—the excitement of a rock concert or the sumptuous drama of a John Williams film score makes me useless, for my whole work is irrelevant to the needs of my epoch, and thus I can only wonder how I became so out of touch. Kea, many thanks for returning to the discussion and many apologies for my inexcusable error concerning your identity which I have now corrected. While I do still love that material, I'm actually more the follower of much more ambiguous and interesting stuff (to me). My fav composers the last few years have been Takemitsu, Rautavaara, Penderecki, Panufnik, and am starting an exercise of digging into Henze's symphony cycle a little more deeply. As for rock concerts? Well, King Crimson is many things, but "color-coded" is hardly one of them. Since 1981, through Fripp's association with Brian Eno (who was influenced by Steve Reich), there's been a heavy strand of Aleatoric techniques in Crimson composition and improvisations. Even Marillion may be more straightforward in the emotional delivery, but lyrically they rarely have to do with "i love you, i miss you, i'm breaking up with you" or any of that (Kayleigh notwithstanding, of course). They are 'Romantic' in style in that the music is written to fit the lyric closely, a-la Schubert, but the lyric's emotional ambiguity leads to a much more interesting music (or vice-versa) than typical pop-rock delivers. I saw this post shortly after looking at photographs of La Nuova Musica's sell-out concert at Wigmore Hall. I turn to the shelf to the right of me and see new discs by a variety of choral groups featuring pre-Beethovenian music. This music has not disappeared, the model has simply changed and it is thriving. And as for Wagner, Mahler and Shostakovich not requiring 'any intellectual involvement or serious effort to listen to', that is absolutely tosh. They perhaps chime with the current trend of maximalism within our culture – long-format TV, marathon serialised novels – yet why denigrate one repertoire to support another? There is as much Bach and Mozart in film as there is Mahler, perhaps more. I'm sorry to say it, but this particular path isn't overgrown... in fact, it's looking rather threadbare. Gavin, this discussion may have been diverted onto some threadbare paths, and if it has I take responsibility. But the original point was not that there is less Bach and Mozart in films than Mahler. It was that there is a disproportionate emphasis on a small group of post-1853 composers, and I still believe that point is correct. Having said that I will now lament your use of the word 'tosh'. If something is wrong, please say it is wrong. If you disagree with something strongly, say you disagree with it strongly. But please keep tosh, twaddle and other emotive pejoratives out of discussions on this, my personal website. They may well be common currency on Twitter, but not here. Please forgive me for the word tosh. It was intended as offensive, merely provide 'wrong' with a bit more punch. The word was used as I seriously disagree with the idea that a concert of music by those individuals – shakily predicated as it is on the idea that their respective soundworlds are remotely analogous – could be devoid of intellectual involvement or effort is highly misleading. And by that I don't mean to me, who cherishes one of those figures and has serious admiration for the other two, but to those engaging with the music for genuine non-cinematic reasons and, most importantly, for the first time. Yes, there is the force of the market, but the Death in Venice effect is very small, given the reach of a nigh-silent art house film. Analysing the choice of Mahler 5 in that particular movie reveals important ideas and connections with the fin-de-siècle... alles für Bildung, after all. We might as well lump in the entire Romantic and post-Romantic repertoire, if we start down that path. If people are really looking for concerts of music that sounds as if it could be film music (avant la lettre), why aren't Schreker, Korngold and Zemlinsky evenings packed to the rafters? Gavin, did you really mean to write "Please forgive me for the word tosh. It was intended as offensive..."
That aside I am quite happy to amicably disagree on this one. Since writing my original post there has been a veritable flood of Shostakovich in the concert hall and on the radio, and I remain convinced that music programming has become too heavily skewed in favour of a few composers. On the Death in Venice effect, I was 22 when the film was released in 1971 and believe me its impact went far beyond the art house circuit. I saw it at one of the major cinemas in Leicester Square and, for many people, it was their first exposure to the music of Mahler. But as above, let's amicably differ on this one. It seems to me that one of the composers who defined the sound of Hollywood film music was Korngold who came out of the Vienna of Mahler and Strauss and brought that sound world with him to Los Angeles. Please comment. Well if I may add, Shostakovich was a film composer as well as composing symphonic pieces. He wrote the scores for over 25 movies and as a young man, he played piano in movie theatres for silent films. So there is a certain amount of pretense for his symphonies sounding that way.